Combining art and science comes naturally to Kate Nichols. The colors in her pieces don’t come from pigment, but from tiny silver nanoparticles suspended in the paint. She makes them herself, as artist-in residence in the University of California, Berkeley’s nanotechnology research group. A graduate of Kenyon College, Nichols left school in 2002 to apprentice herself to San Francisco-based artist Will Wilson, an expert in 15th century oil painting and paint-making techniques. Under Wilson’s tutelage she learned to create her own pigments out of linseed oil, lead oxide, and resins. At some point, her interest was piqued by the blue-green iridescent hues of the Morpho butterfly. Pigments absorb particular bandwidths of light depending on their chemical composition; whatever is not absorbed is reflected, and it is this reflected light that determines the color we perceive. Structural color isn’t chemical: Instead, tiny structures, often smaller than a single wavelength of light, redirect and slow light waves down, causing them to interfere with each other in ways that depend on the shape, size, and spacing of the scattering structures, as well as on the angle of the incoming light and the position of the observer. In the case of the Morpho, these structures scatter blue light most strongly; its hue shimmers and shifts to lighter or darker blue as the butterfly moves, producing iridescence. Structural color is also at work in peacock feathers, fish scales, and beetle casings. Thanks to her recently acquired paint-making skills, Nichols thought it might be possible to make nanoparticle-based paints for her art, where the color would also arise from structure rather than pigment. So she contacted UC-Berkeley physicist Paul Alivisatos asking if he thought this would work. Alivisatos was so intrigued by the idea that he invited her to work in his laboratory. Kate Nichols in the lab. Credit: R. Kaltschmidt/Berkeley Lab. Nichols didn’t have much to show for all her hard work by the end of her year, save for a lot of slides coated with silver nanoparticles and vials of dull-brown solutions — and some mad new skills in chemistry and advanced synthesis techniques. Basically, her nanopaints looked great in the bottle, but “if I put it on a glass surface it looked like my dirty windshield,” she told Nautilus. Eventually she decided to stop fighting her materials: nanoparticles suspended in liquid eventually want to find a level, so she worked with that, pipetting her solutions into glass tubes. Then she torched the ends of the tubes, sealing the particles in a vacuum, and waited to see what would happen. She found that at first, the silver nanoparticles appeared turquoise, but over time their corners rounded off, turning them from triangles into discs. This shifted their hue to more of a royal blue as they settled to the bottom of the tube. Nichols used those tubes to create sculptures, but she still wanted to create a usable nanopaint. She found that by using nanoparticles shaped more like soccer balls and suspending them in organic solvents, she could get them to adhere to glass. And over time, she figured out exactly how the solvent dried, and how her pieces would look in different kinds of lighting. Figment 1, 2014, silver nano particles on glass, 2014. Kate Nichols. Nichols gave a TED talk about her work in 2010, and has exhibited her “Through the Looking Glass” series at the Leonardo Museum in Salt Lake City. Among her most recent work is a group of small sculptures in a series she calls “Figments”: small triangles of glass coated in nanoparticle paint, joined by a hinge, whose colors brighten or darken depending on the viewing angle. 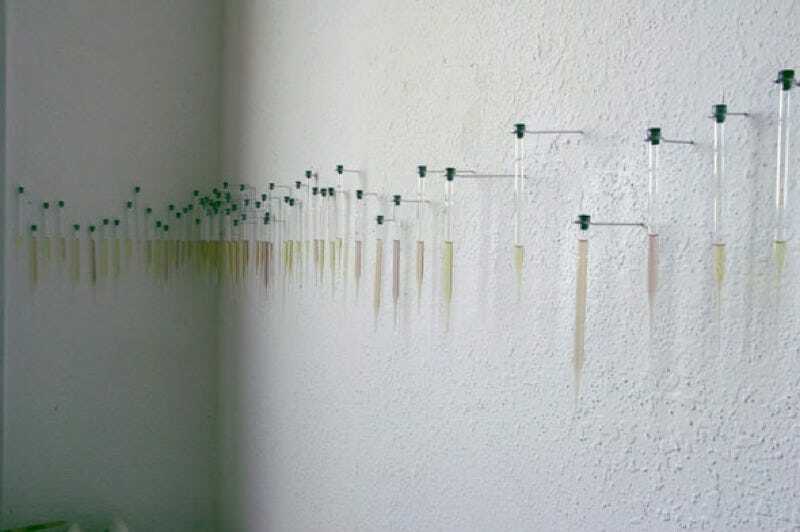 Top image: Hysteresis, 2009, silver nanoparticles, glass pipettes. Credit: Kate Nichols.